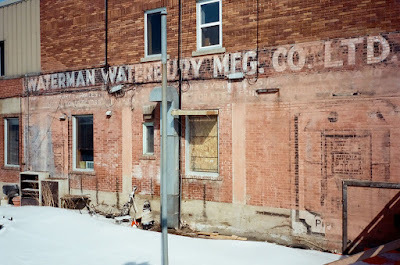 This advertising pencil caught my eye--not only with the Waterman name, but Minneapolis, too, where the vast majority of my dad's large Waterman family was and is based. There must be a family connection somewhere. The Melrose Park, Illinois, Dur-O-Lite pencil is Bakelite, celluloid marble, and chrome-trimmed metal. Twist the black end to advance the 1.1mm lead. Pull off the cap for the eraser, which has a clever notch for assisting in the removal of the old eraser in its metal holder, and inserting a new one. It is one of the reasons Dur-O-Lites are interesting--many models have some clever design and engineering features. The pencil has a streamlined 30s feel to it, combined with the materials of the 1930s and the pre-1938 lead size. It is 5 & 3/8 inches. The tip pulls away to show the Dur-O-Lite trademark and the sturdy screw-mechanism with paddle end that advances the lead. The top of the trade-marked nose that the tip fits over cleverly becomes a decorative bead on the barrel of the pencil. Someone thought that through effectively! 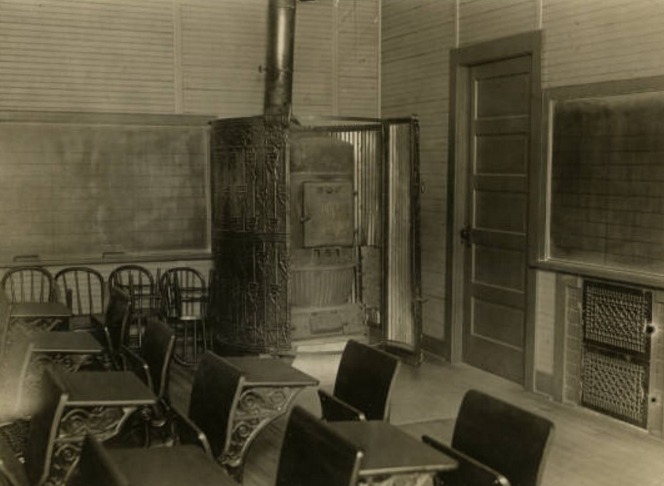 The Waterman-Waterbury Company was a maker of patented "heating systems" for school houses all over the Midwest and beyond. 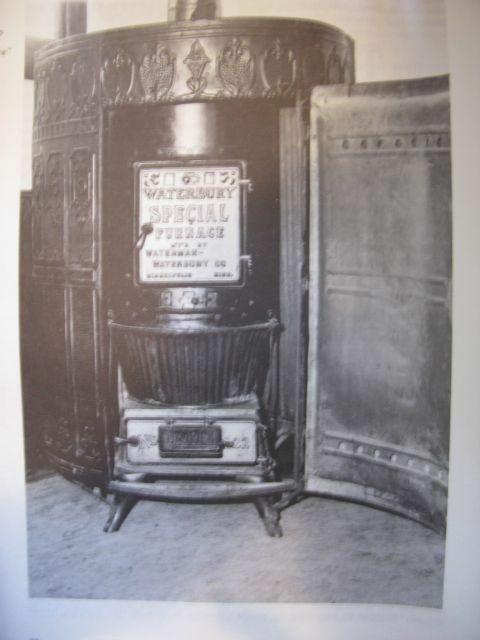 Here is one of the early "systems," a cast iron wood or coal burning stove encased in a decorated housing that drew cold air from an outside air intake, heated it in the housing around the stove, and allowed it to rise from the top of the housing as warm air by natural convection. Their claim was that this provided better ventilation and cleaner warm air. 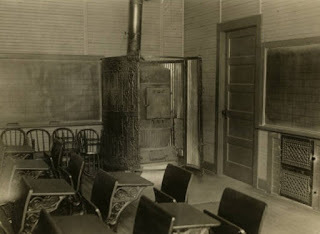 Here is the heating system as it looked in a 1919 school room. Besides their location in Minneapolis, the Waterman Waterbury Company also had a presence in Canada, where the company expanded its work to include contracting and building. On the right, under LTD., you can see the remains of a painted representation of the patented heating system. In 1946, Minneapolis was hit hard by more than 5,600 cases of polio. That year's state fair (the State Fair that the musical was based on) was unthinkably cancelled so the disease would not spread through the crowds. The Waterman Waterbury company hurried to help create a prototype iron lung.